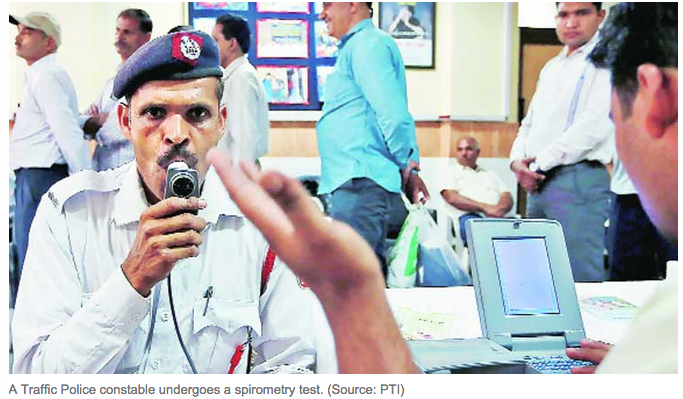 “With alarm bells ringing about Delhi’s air quality, traffic policemen in the city will soon get protective eye glasses that will shade their eyes from road dust. Delhi traffic police has sent a requirement of around 2,000 such glasses in their first batch, tenders for which will be floated soon, a top official said. Explaining the need to procure these glasses, special commissioner of traffic, Muktesh Chander, said, ‘Traffic police personnel spend hours on the road and this makes them especially vulnerable to road dust. Studies have established that road and construction dust contributes to air pollution, which creates problems like eye allergy, especially in the dry heat. These will have covering from the sides and top, to protect their eyes from dust.’…Earlier this week, in health checks conducted for 160 traffic police personnel for chest and lung diseases, about 25 per cent showed problems in their lung function tests, with symptoms like shortness of breath, wheezing, chest tightness or pain, chronic cough and trouble with sleeping.” The Indian Express. Read it on delhiair.org.